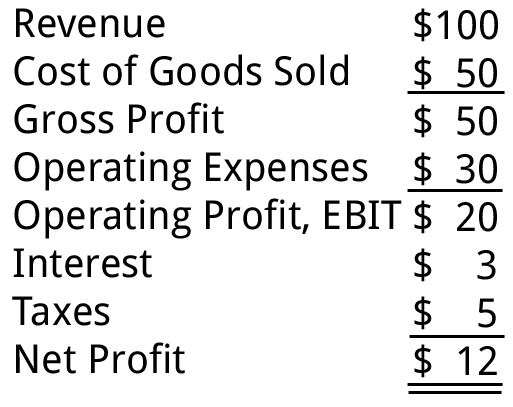 An income statement shows the revenue (how much money came in), expenses (what you paid for), and profits (what is left over) for a specific time period. Don’t be confused by all the different names for an income statement, it can also be called a profit and loss statement, P&L, statement of earnings, or statement of operations. Sometimes the word consolidated is thrown in front of those phrases, but it’s still just an income statement. 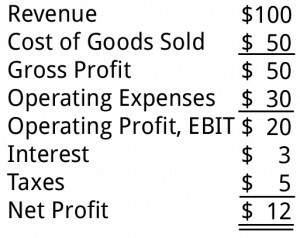 The bottom line of the income statement is net profit, also known as net income or net earnings. Income Statements all follow the same format, some companies will have more items but here are the basics. Amounts shown are in thousands. Revenues, also called sales, is the dollar value of the products or services a company provided to their customers. Some companies break out their revenues into subcategories so they can see where the revenue is coming in from. An example is Google who lists out Google (advertising and other) and Motorola Mobile (hardware and other). Cost of Goods Sold (COGS), also Cost of Sales (COS), or cost of revenue. These expenses relate directly to producing a product or service. Gross Profit (GP) is calculated by taking Revenue – COGS. This provides you with the basic profitability of the product or service you are offering. In our sample company that is Revenue of $100 minus COGS $50 for a Gross Profit of $50. Operating Expenses are the costs that keep a business going, like rent, utilities, salaries, benefits, and insurance. Most companies break these out into different categories to show where the money is going. An example is Apple who lists Research and Development, Selling General and Administrative, Non-Recurring, and Other. Operating Profit, operating income, or EBIT (earnings before interest and taxes), is calculated by taking gross profit minus operating expenses. This is the profit made from running the business. Taxes, Interest, Other – Interest expenses paid on loans, business taxes for the year, and other miscellaneous expenses are recorded in this category. Net Income, net profit, net earnings, or the bottom line, is what’s left over after all the costs have been subtracted from revenue. Hopefully it’s a positive number, if not then it’s a Net Loss. Training classes go through the key terms on income statements where you will get a clearer picture of what your company is making and what the expenses and costs are. 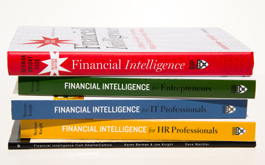 You’ll also go through some key ratios and learn the story the financials tell about your company.